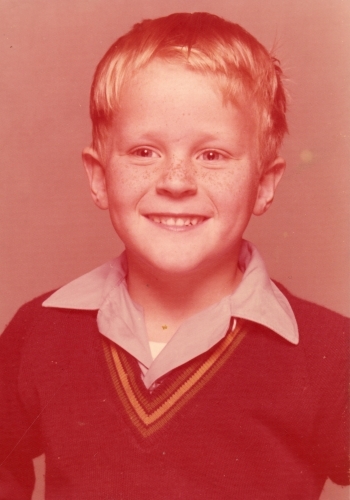 It was 1974 and I was 8 years old. 1974 was a time, for me anyway, when you played all day with the neighbourhood kids – riding your bike, football, cricket, fishing, Cowboys & Indians, Cops & Robbers, trying to chat up the beautiful Catherine Beazetto….all these activities jammed into endless summer days. One of the real treats in the neighbourhood was going over to the local shop and enjoying the delicacies that were Fizzy Tizzy (pure sugar), Freddo Frogs and sherbets. The local shop was owned by Mr Spinks. Mr Spinks was, to my 8 year old eye, approximately 140 years of age. He was also well over 11 feet tall. That, I was sure, made him the world’s oldest and the world’s biggest man. Mr Spinks wore a long brown coat at all times, much in the style of a doctor’s coat. He’d slowly fill your orders wandering around the shop in a very methodical manner which indicated to us children that he was perhaps even older than the 140 years we’d assumed. Mr Spinks had a daughter. Appropriately her name was Miss Spinks. Miss Spinks did not, to any of the local kids knowledge, have a first name. She was also very old – she must been at least 30. Mr Spinks and Miss Spinks would attend to the local kids needs, whether it was buying a lettuce head for mum or 5 cents worth of mixed lollies for yourself. That’s where you would take your time – often changing your mind 42 times as it is every kid’s right to do – selecting from the huge array of sweets as Mr/Miss Spinks would dutifully fill the bag with your selected treasures. Oh how they must have hated the sight of 3 or 4 grubby kids swinging through the door, pointing at the prized lolly counter and saying “I’ll have 1 of those, and 1 of those….no, wait, make it 1 of these….” and on it would go. I struggle to understand to this day how they made enough money to survive, or where they got their incredible patience from. But the real feature of the shop was the milk. Cold, delicious full cream milk that came in bottles with a foil lid. Taking the foil lid off revealed the incredible treasure beneath – a thick film of beautiful sweet cream. I can still taste that cream now if I think hard enough. I think hard a lot. If you had been industrious enough to collect recyclable cordial bottles (1 cent each), or (like me) mowed grumpy old Mr Batchelor’s lawn for 5 cents a few times, then you’d have enough for the greatest prize of all. (The main reason to mow Mr Batchelor’s lawn was so you could retrieve the hundreds of balls that found their way into his backyard that he refused to throw back. Anyway, back to the greatest prize of all. This was real flavoured milk I’m talking about. Not some highly processed muck they serve up in cardboard cartons or plastic these days with some fancy nancy name that’s more about ‘branding’ than drinking. Miss Spinks would grab a bottle of milk from the depths of the ice chest. The bottle would be placed on the back bench. Pressing down on the foil lid of the bottle, Miss Spinks would remove same with a deft touch and place it carefully to the side. Then in goes the teaspoon to scoop out the cream. That teaspoon, with cream dripping off it, would be offered over the counter to the freckle faced little boy (me) who was practically salivating at the thought of what he was about to receive. A little milk was then poured from the bottle. The greatest chocolate syrup the world has ever known (Cottees) was then poured in to replace the milk poured out. Enough room was left in the bottle to allow for mixing to take place. The foil lid was then placed carefully back onto the top of the bottle and vigorous shaking then took place. This had the effect of mixing in the syrup with the milk and was essential to a well-balanced chocolate milk drinking experience. It also served to raise the anticipation levels of the waiting child to what could safely be termed a ‘frenzy’. Pavlov’s salivating dog had nothing on me as I was waiting for my flavoured milk – I understand that Miss Spinks often had to mop the floor after I’d left with my milk to ensure no customers slipped on the drooling spot I’d occupied just minutes before. Anyway, after what seemed like hours, I handed over every cent I’d saved and Miss Spinks handed back what can only be described as bliss in a bottle. Ice cold full cream milk infused with a syrup so sweet that schoolchildren’s teeth had reportedly dissolved immediately upon direct “teeth to syrup” contact (this is why it was well known to children that mixing with milk was best). As I raced out the door with this perfect concoction, I was, without question, the happiest boy who ever lived. 2 seconds later I was the saddest boy the world had ever seen as the glass bottle slipped from my little hands and smashed to smithereens onto the pavement – what had once held so much perfection was now a puddle flowing away into the gutter. Tears immediately gushed from my eyes like a newly struck oil well and I would have surely died of dehydration within seconds if it wasn’t for the comforting arm of Miss Spinks who rushed to my aid. You see, she’d watched the unfolding horror from inside the shop and knew the gravity of the situation. She knew the lifelong happiness of little Brendon Sinclair was at risk. Miss Spinks bustled me into the shop and sat me down on a rickety old chair in the most revered of spots… behind the counter. It was like entering the promised land. No one, not even my 4 older brothers, had ever been ‘Behind The Counter’. As I fought to quell my crying (it had reduced to merely constant sobbing by this stage), Miss Spinks worked her magic. I could hear a flurry of activity beside me, but dared not look. Miss Spinks was scooping here and there and then shaking something with the well-practiced arm of a veteran. “It couldn’t be, could it?” thought I, as I sat on that little chair. I could only now make out vague shapes from my bleary, teary eyes. But I had a glimmer of hope. Just one glimmer. A moment later that hope had turned to beautiful reality when into my hands, now positioned in a cradling way, was gently placed a new ice cold bottle of chocolate flavoured milk. “It’s alright Brendon,” said the kind Miss Spinks, the most beautiful, kind and wonderful woman in the world, even surpassing (at that moment anyway) my own mum. I was still sobbing when I returned home – through the Gerlach’s driveway into their back yard, through the bushes into the Hiller’s backyard and then through the hole in our fence into our yard – 40 seconds later carrying the greatest prize of all. I sat on the lawn in the summer sun, under our big old peach tree and drank straight from the bottle, as was the way of 8 year old boys, the most perfect drink ever made – milk, chocolate syrup and (the most important ingredient ever added) a dash of kindness. We run a few business and consult with many more. Customers usually assume they have a fight on their hands to get a replacement/refund if something goes wrong. But they don’t know I learned my customer services skills from Miss Spinks. All I have to do is remember how I felt when something went wrong. And then remember how I felt before Miss Spinks made it all better. Then I do what I think Miss Spinks would have done. That’s customer service. Taught by Miss Spinks in 1974.